A forest area the size of 48 football fields is lost every minute. Last year, we planted over 1,494 m² of new woodland trees! That’s a lot of trees. Following on from our recent blog post about our day spent planting trees for the Woodland Trust, we wanted to make you aware of the other ways in which we are working towards being the most eco-friendly printing company in the UK. We believe that the well-being of forest communities and ecosystems is as important as replacing trees! We ensure that all of the paper we use is sourced from FSC®-certified mills and sustainable sources. The FSC (Forest Stewardship Council ®) is dedicated to promoting responsible management of the world&apos;s forests; this includes a balance of environmental, social and economic aspects. The FSC is supported by numerous environmental groups, such as WWF, Greenpeace, Friends of the Earth, and of course the Woodland Trust. We use high-quality vegetable-based inks which do not affect the standard of our work; these inks are less harmful to the environment than their petroleum-based counterparts. Vegetable-based inks are derived from renewable sources such as corn, linseed and canola. No volatile organic compounds (VOCs) are released during the use of vegetable-based inks, and no toxic waste is produced during recycling. We tightly control our stock and scheduling practices, ordering only the quantities of ink we need. We recycle any unused inks. Our printers use the best chemistry-free B2 and B3 plates. These plates have a longer lifespan than traditional, more toxic chemicals. They also help to reduce the chemistry and waste from processing printing plates, thus further reducing our environmental carbon footprint. Our HP Indigo press offers non-toxic, long-lifespan consumables, and uses considerably less energy than competing technologies. 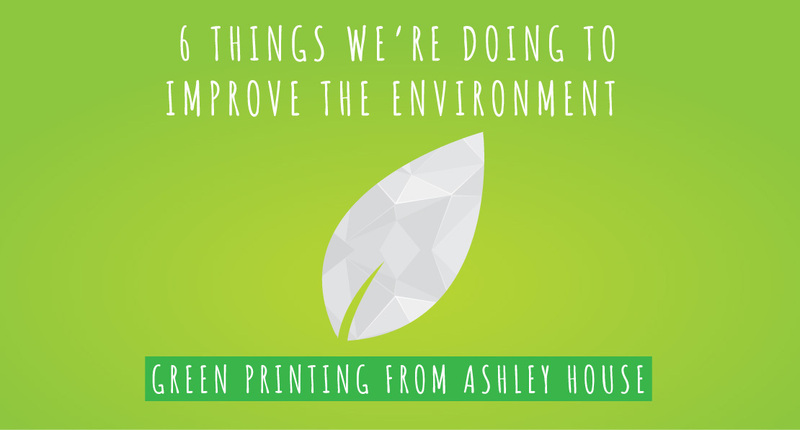 At Ashley House, we abide by a strict recycling policy, which ensures that we recycle everything! This includes all of our waste products, from waste paper to ink tins, used printing plates, wooden pallets and plastic wraps. We even buy our energy from a green energy supplier. We use their sustainable power, which means there’s less harm done to the environment when using all of our machines. Our green energy supplier works hard to make green energy an option for more people. We only use delivery companies who comply with carbon emission standards. Our pallet courier is very conscious of their carbon footprint – they use Adblu fluid in 80% of their vehicles and have implemented a waste management solution involving recycling. They use Mandata to provide careful route planning, and as a group The Pallet Network’s model is proven to be one of the most efficient forms of transport. This reduces not only costs but also carbon emissions – a green solution. In 2015, our overnight parcel courier delivered 969 million carbon neutral parcels; they are fully committed to making every parcel delivered carbon neutral. They have very specific initiatives to improve the efficiency of their transport network: these include the use of alternative fuel vehicles, or incorporating suitable vehicles like double-deck or long combination trucks. To offset their remaining transport emissions, they finance renewable and cleaner energy production projects by purchasing carbon credits. More than three million kilometres have been travelled by their alternative energy fleet, and more than 800,000 tonnes of CO2e have been offset!